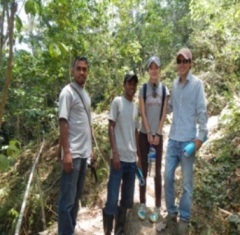 Aplimentec have been working with The Promise, a Korean NGO, for the installation of new water supply systems and one system refurbishment in the Asumano Suco in Liquica. Aplimentec undertook the survey and design earlier this year, and have had one staff member, Jeronimo Pereira dos Anjos, working full time to help monitor construction quality. When complete the three systems (Nunupu, Quirilelo Lower, and Quirilelo Upper) will provide water to approximately 780 people. 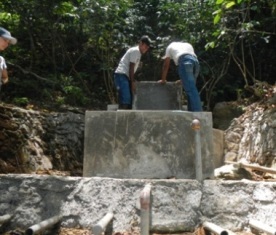 The construction has been undertaken by the local communities. On Friday Roni and Mathilda from the Promise took Aplimentec staff Lino and Suzie to visit the water systems (and to help with a couple of technical questions).We all had a great day inspecting the new tanks and following the pipelines through the coffee forests back to the newly constructed intakes for the Nunupu and Lower Quirilelo systems. A highlight of the day was visiting the Lower Quirilelo community where the system is already 90% complete and seeing members of the community using the tap stands. It’s always nice to see your designs working the way they are supposed to! The Promise have done a fantastic job bringing these projects to life, we can’t wait to go back for another visit to see the future progress.